Diverse group of young people running along a seaside promenade. Fit young runners training outdoors by the seaside. So you’ve been training for months and finally worked up the courage to enter the Sanlam Cape Town Marathon. As time nears for the gruelling race, you suddenly realise that you might have bitten off more than you can chew. Don’t panic. Get outside your head and let us show you what to expect during your 42.2km journey. This journey is one aimed to put even the most seasoned athlete to the test. The classic Olympic distance of 42.2km is definitely an achievement to be proud of. Expect to reach a point where your body will feel like it has no more left to give. At this time, know that you still have about 30% left and you’ll need to push through the pain. This is where your training and mind-set will play a huge role in you finishing. Walk when you need to conserve energy and pace yourself. This is not only a gruelling physical activity but also a mental one. Spectator zones will be allocated along the route, take a breather, grab something to drink and draw some motivation from the amazing supporters who came out to cheer you on. Chafing is caused when exposed body parts rub together and create friction, leaving you red and painfully blistered. If you’re a first time marathoner, you can expect a lot of chafing. However, you don’t need to put your body through all that. Before the race, apply tons of Vaseline on areas prone to chafing. Apply a generous protective layer of Vaseline on your skin and focus on more important things during your run. As you’ve been training, you should know by now what foods can carry your body through as you train. Eat up and get enough fuel needed before the race. It is easy to forget and get dehydrated during the race so keep in mind that grabbing a quick drink as you pass a check point is important. You might want to consider taking some hydration tablets before your run to ensure you don’t get dehydrated. As you prepare for the journey of finally completing your first marathon, try not to overthink things. It is easy to fall into a mind-set where you set certain standards and begin obsessing. Remember to enjoy the long run. Take in the beautiful scenery and remember to control your breathing. Let everything else go. As you prepare, track your runs and observe your progress but don’t begin to obsess over everything you do. Even during your race, be sure to let go and let your legs take one step at time. It helps to have someone with you running the same pace. Find a running buddy who enjoys the same pace as you and motivate each other throughout the race. Start conversations and help each other over the crossing line. It will help not focussing on the running as much and simply enjoying a light conversation with your buddy. Time will move faster and you can trick you mind to focus on something other than running. Do research on the route before the race so you’ll know where the most arduous turns and hills can be expected. The race starts at the V&A Waterfront. It follows Mouille-Point Beach-front into Cape Town’s City Centre, and past some historical landmarks of Long Street, Mount Nelson Hotel, South African National Gallery, South African Holocaust Museum, St Mary’s Cathedral, Houses of Parliament, City Gardens, City Hall, and the Castle of Good Hope to mention a few. You’ll then head towards the Southern Suburbs. Turning back to the City alongside the Liesbeek River, before heading out along the National freeway towards Paarden Eiland. Now you’ve reached the last stretch as you make your way past the World Cup 2010 Fanwalk towards the Cape Town Stadium. Your 42,2 km journey ends at Green Point A track. Here along with thousands of spectators and runners, everything will come together and culminate into a celebration. Before the race you’ll worry about everything from sleeping well the night before and cramming all your preparation to the night before. Use the entire week before the race to get some good rest. Your body will need the rest and your mind will too. Focus on positive thoughts. Listen to motivational music or podcasts and get your game face ready. Remember to have fun. If you not having fun then what’s the point. Don’t focus too much on finishing the race within a set time. This is your first time. Be kind to your body and take it one step at a time. 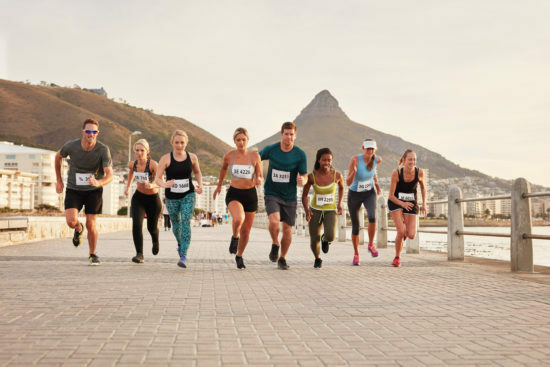 The Sanlam Cape Town Marathon takes place from the 16th – 17th September and is one of the biggest sporting events on the Cape Town calendar. Simply just participating and making a concerted effort to change your lifestyle for the better is already half the battle won. Have your loved ones and friends come support you. Knowing they’ll be there waiting for you at the finish line might give you that extra bit of motivation to fight through some cramps. Let Vineyard Car Hire take you where you need to be, don’t miss out on what Cape Town has to offer. Order a reliable car to get you and your family to the Sanlam Cape Town Marathon.